DISC assessment gives you the power to quickly and easily create and explore personality profiles for all your people. There's a major advantage in having a clear understanding of the people around you, and personality profiling can give you that advantage. Whether you're hiring, leading, team building, dealing with sales - in fact, however you need to work with other people - having an objective and comprehensive insight into different personalities can give you a real edge. 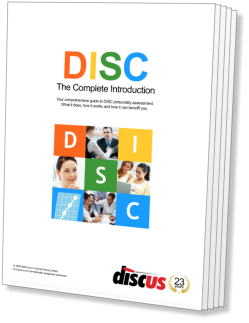 DISC is one of the most widely used personality profile systems in the world today. It's easy to use, with quick and simple personality questionnaires, but its results can give you all the information you might need, looking in detail at topics that are directly relevant to you. There are lots of personality profiling solutions around, but the DISC approach has some real advantages: it's quick to use, simple to administrate, and it gives really powerful and useful results. DISC has been in development for decades, and is now one of the best established profiling tools around, and there's plenty of research showing how effective it can be. What's more, DISC can be amazingly cost-effective, at a price point that makes it possible to create profiles whenever you need them. A DISC profile is created from the answers to a simple and straightforward questionnaire. Those answers are interpreted to measure four core personality factors: Dominance, Influence, Steadiness and Compliance, whose initials give DISC its name. It's from assessing the combinations of those four personality factors that DISC can give you real insights into a personality. That's just a simple overview of the DISC profiling process. If you want to find out more, visit our How DISC Works page, where you'll find plenty more detailed information. If you want to see the advantages of DISC for yourself, the Discus profiler has everything you'll need to get started. Discus is a complete DISC profiling solution: it'll present questionnaires for you, analyse the answers, and use its built-in expert systems to give you results that are meaningful and understable. Discus does more than just DISC profiling, too: you'll find an amazing array of extra features all ready to use, including job matching, team building and relationship assessment. Those are all part of the package, free and unlimited to all Discus users. Profiles in minutes: A typical DISC questionnaire is easy to understand, and takes about ten minutes to complete. Online profiling: Invite candidates to take a DISC test online, and see their results immediately across the Web. Instant results: Questionnaires can be scored and assessed automatically, so you'll see a report as soon as the questions are complete. Consistent and reliable: Use DISC as an objective benchmark for assessing suitability in recruitment and team-building. Cloud-based profiling: The Discus DISC profiler is completely cloud-based, so you can manage your DISC results wherever you are, on any device. Ready to go: The Discus profiler is ready to use as soon as you're signed up. You'll be ready to start creating DISC profiles with just a couple of clicks. Choose the package to suit you from our range of special business offers. Discover why personality profiling is used by so many professionals worldwide, and how you can start using it immediately to help your business grow and prosper.